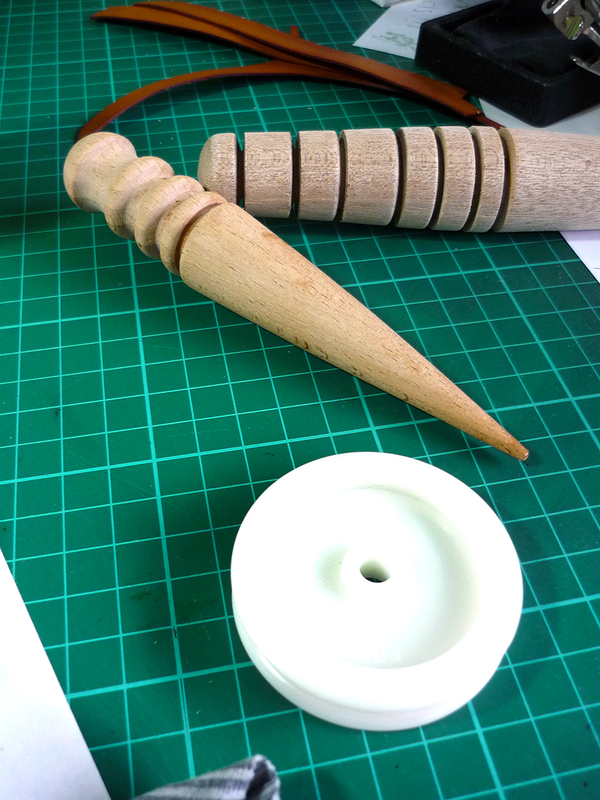 I have just finished working on a commissioned piece for a very special client. 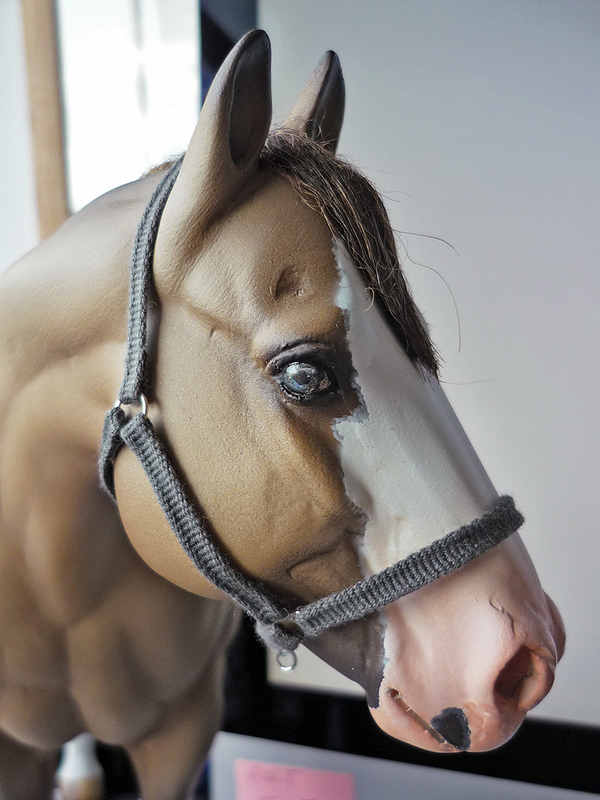 This saddle will be winging its way to Mexico today, into the collection of Luis Aguilar, who makes the wonderful resin horses you see throughout this site. So just a bit of pressure to do a good job! Fortunately I had his own resin saddle tree and stirrups to work with. So much better than my own hand made trees, the difference in stability and not having to worry about breaking things made the process of creating this saddle so much easier and a lovely experience, I think the result speaks for itself. 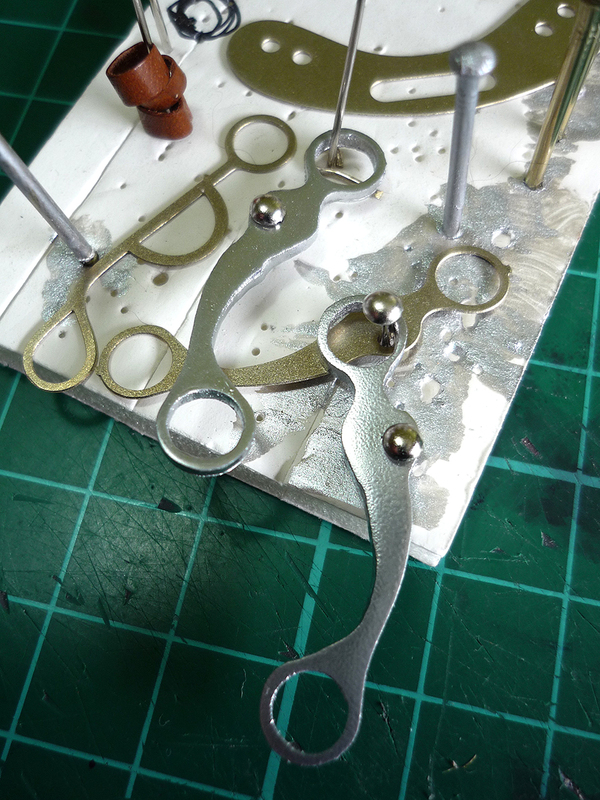 Although there are plenty of resin saddle trees at Traditional and Classic scales, not so many available at the 1/6 scale I use and certainly not available to buy in the UK, but watch this space! 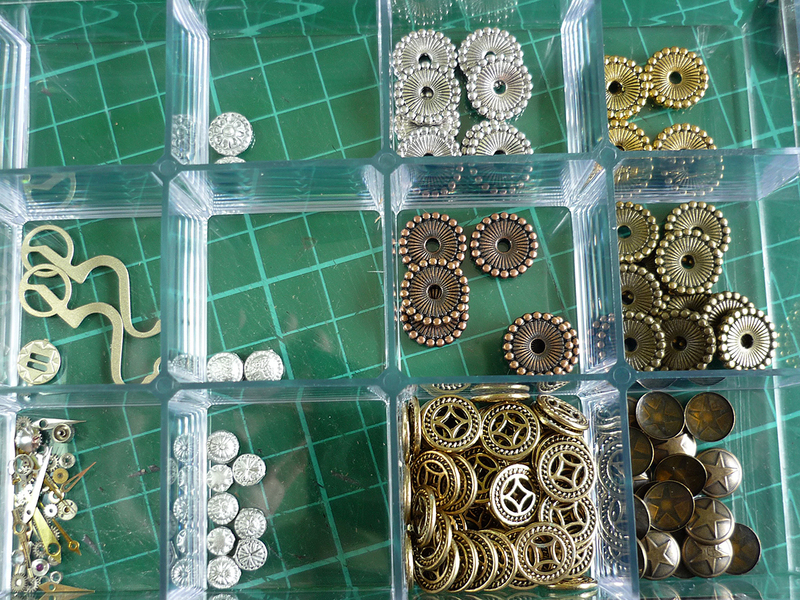 I came across the term findings when I started looking for items to use on my tack pieces. 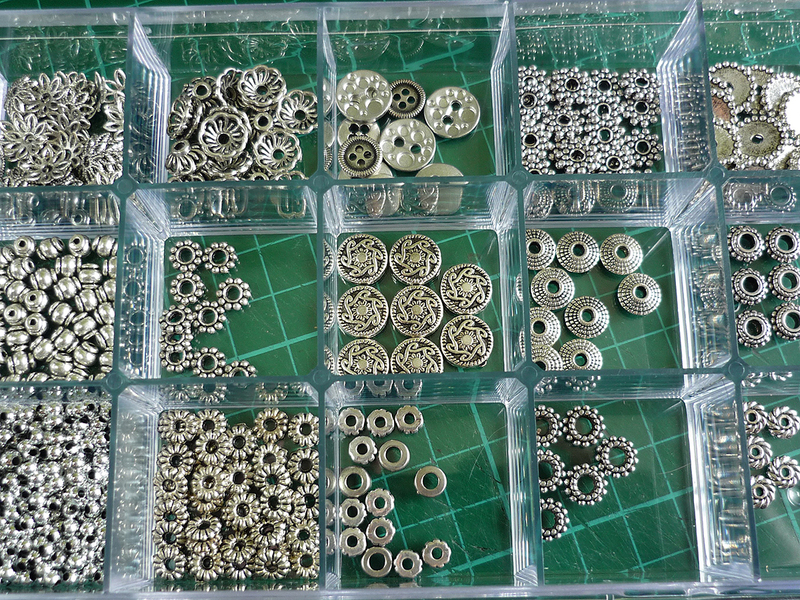 It seems to belong to the jewellery making world, Wikipedia says “Jewellery findings are the parts used to join jewellery components together to form a completed article”. You don’t have to spend much money on these items, it’s a great (cheap) shopping trip. Sometimes you don’t even need to buy anything, just keep an eye out for things that look to be in scale to what you want to achieve. The grey fabric halter was made from the strings holding the tags on my Fat Face jumpers! 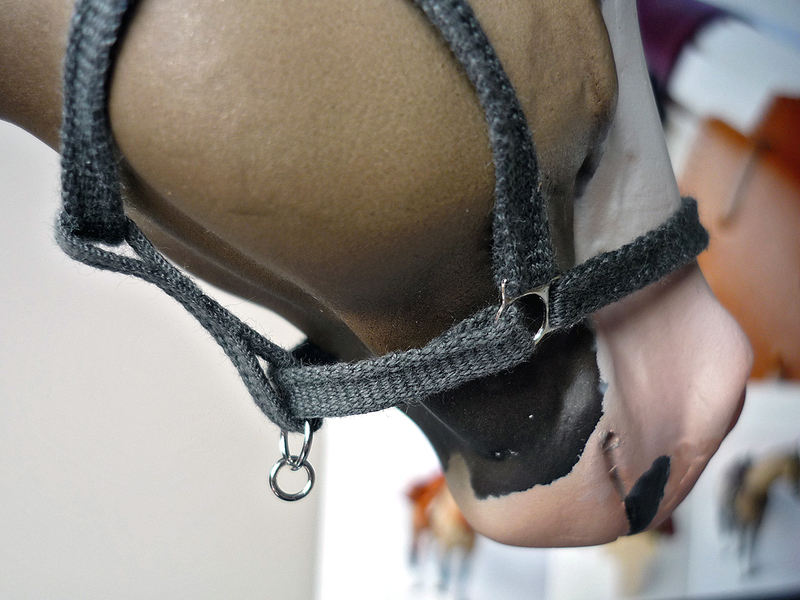 But they looked right when I spotted them so I kept them in a drawer, along with many other bits and pieces, until I decided to give the halter a try. And who doesn’t love tiny, shiny, sparkly things anyway. Mooching around craft shops like The Range or Hobbeycraft, any local stationary shops, out of the way places in bohemian parts of town. I’ve had some great bits and pieces from the pound shops. Its only the specialised items that tend to break the bank a bit! 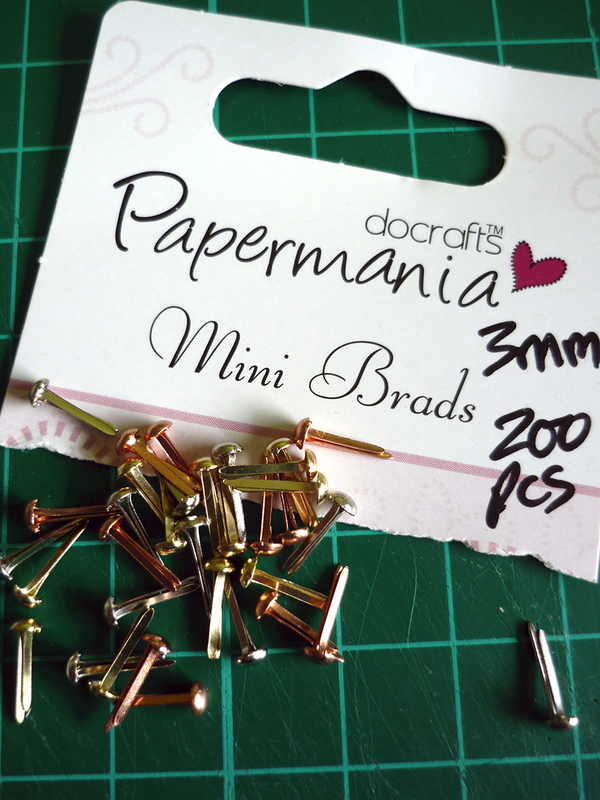 Lots of the paper crafting items cross over really well, brads look great if they are small enough. 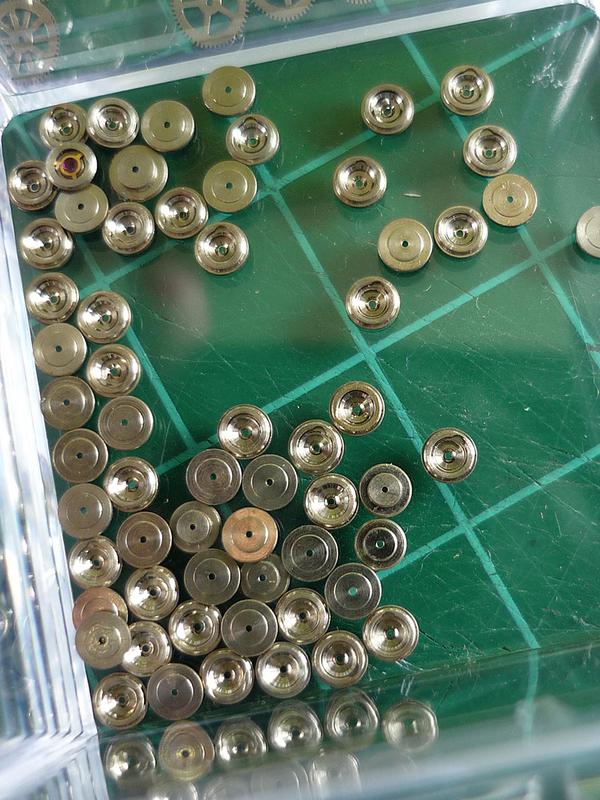 I found some beautiful buttons in my Mum’s button box which I am keeping aside for breast collar centres. 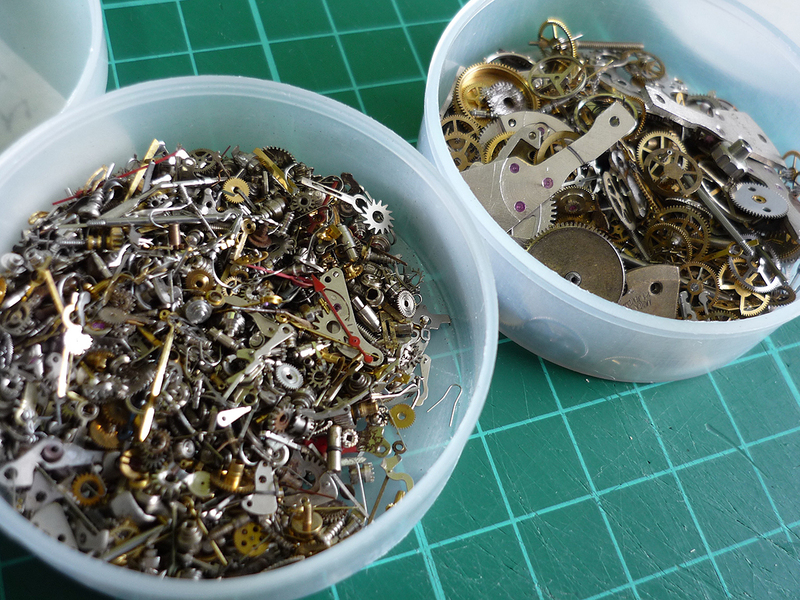 One of my best finds was watch parts! 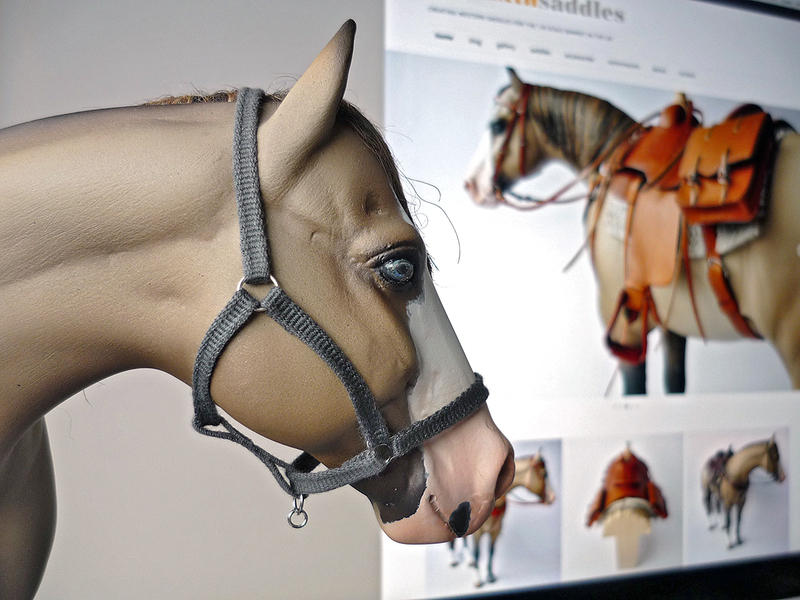 I have an idea to do a steampunk saddle in the future, I love steampunk. The first order of parts (Ebay purchase) were slightly too big, but useful I hope. 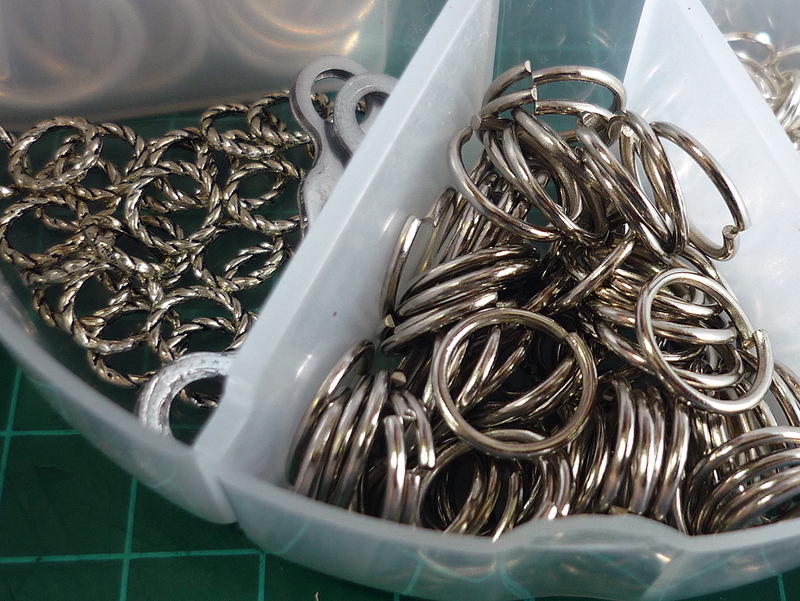 The second order has tiny, tiny parts but they are ideal for bridles/halters embellishments, replacements for studs, and you get plenty to work with. 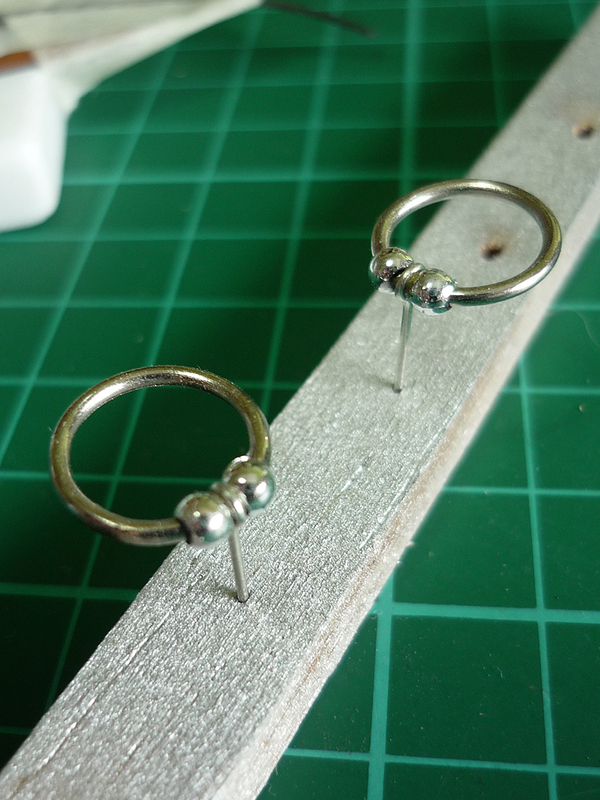 Jump ring with beads and a wire to make a snaffle bit, superglue is required! 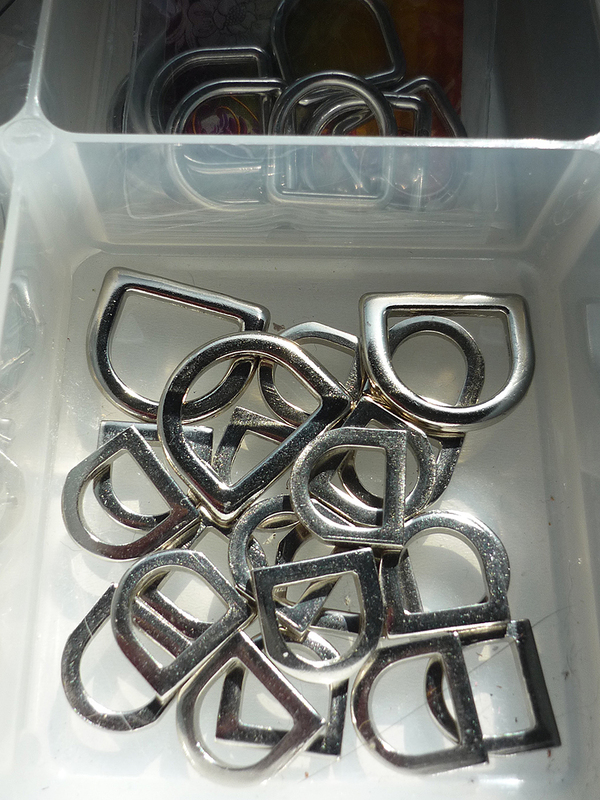 I have no idea what these are but they are a great size for stirrups! 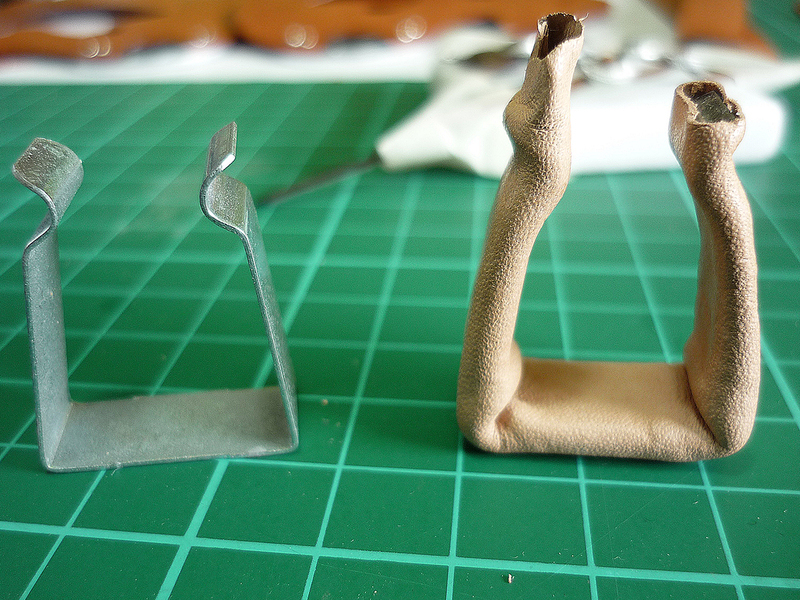 Working on 1/6 scale saddle pieces needs thin leather in good condition. 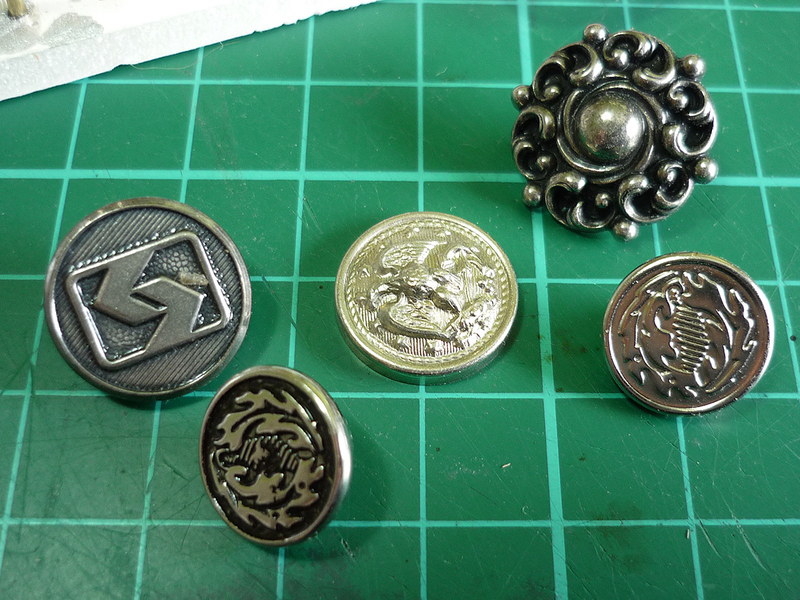 On the advice from the Tandy leather guys in Manchester, I picked up some extras to improve the quality of my finishing. 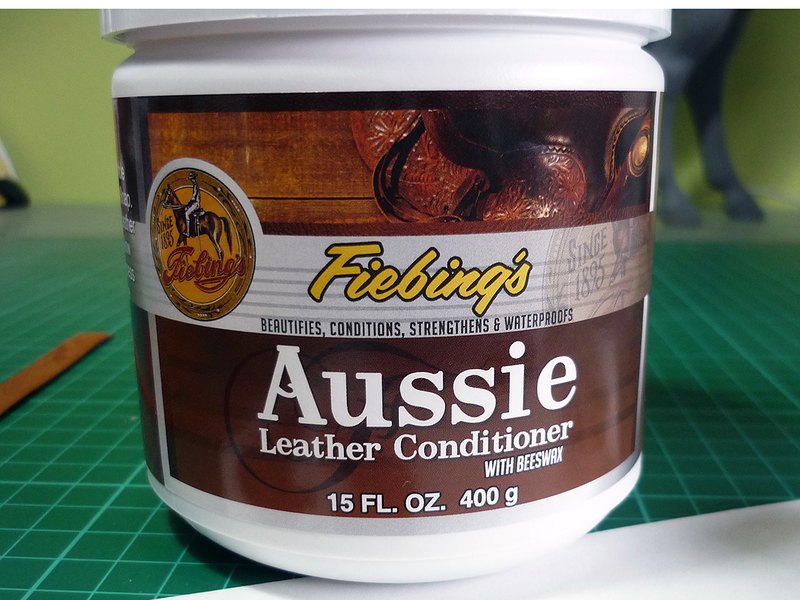 For the leather itself, Aussie Leather Conditioner, a product to keep it supple and workable and stop it drying out. 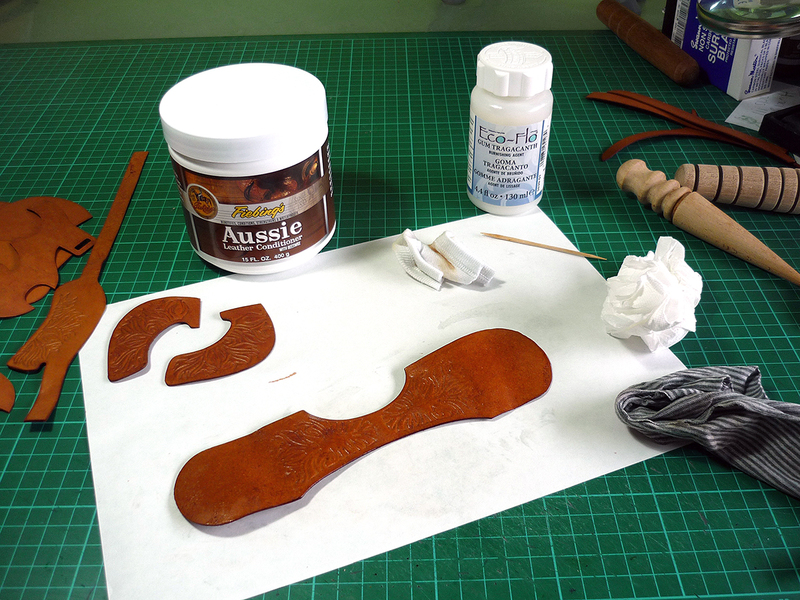 It is very useful for dry leather, I’m just testing it out, applying some then doing a dye, see if it goes on smoothly. 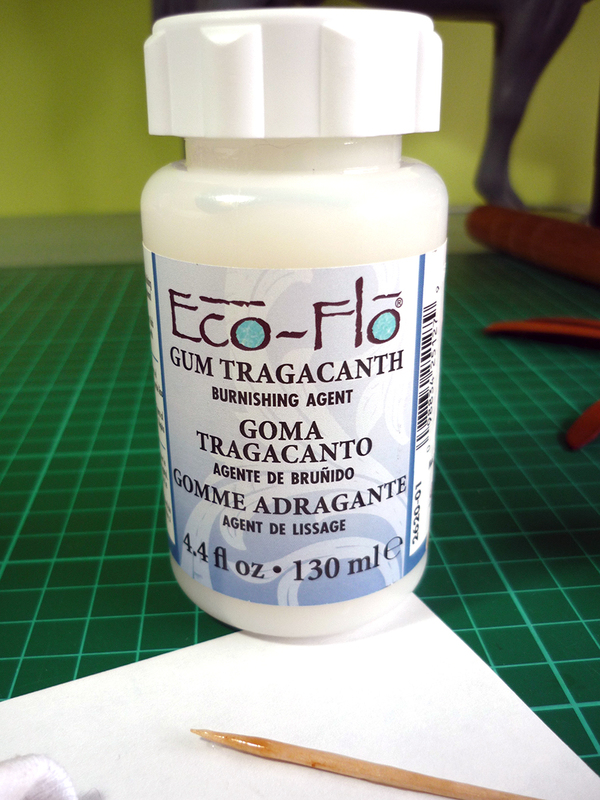 Also Gum Tragacanth and a variety of leather edge burnishers (I’m still trying to find the best ones for thin leather!). But it does make for a really beautiful finish on the edges of the leather. I’ve had a set of Al Stohleman cut saddle pieces in my box for a while now – I’ve been distracted by a somewhat ‘left field’ commission – so I decided to get dyeing last night and get it completed. Today I used the conditioner and edge finishing and the colour has turned out beautifully after being somewhat pale and uninteresting when first dyed. 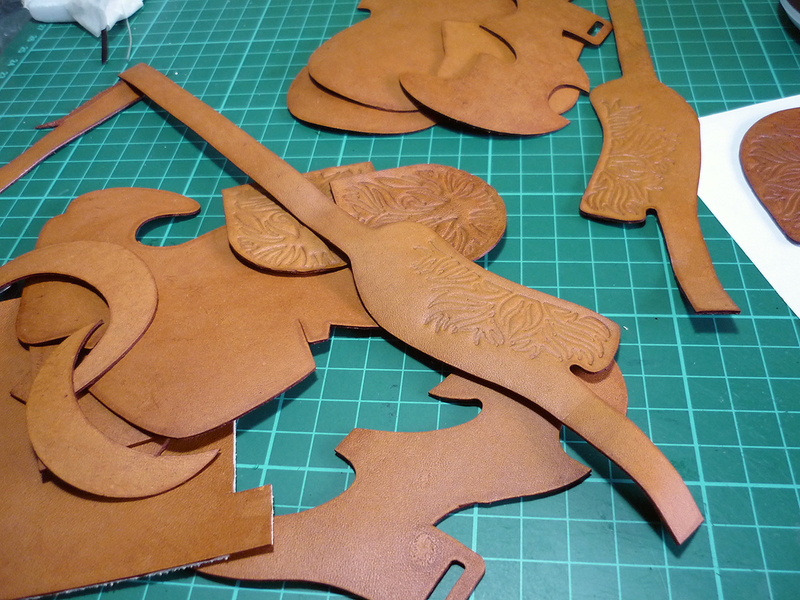 I’ve used 3D stamps on the saddlebags, back jockeys and fenders and I will be using the new photo etched pieces too, it’s all very exciting! 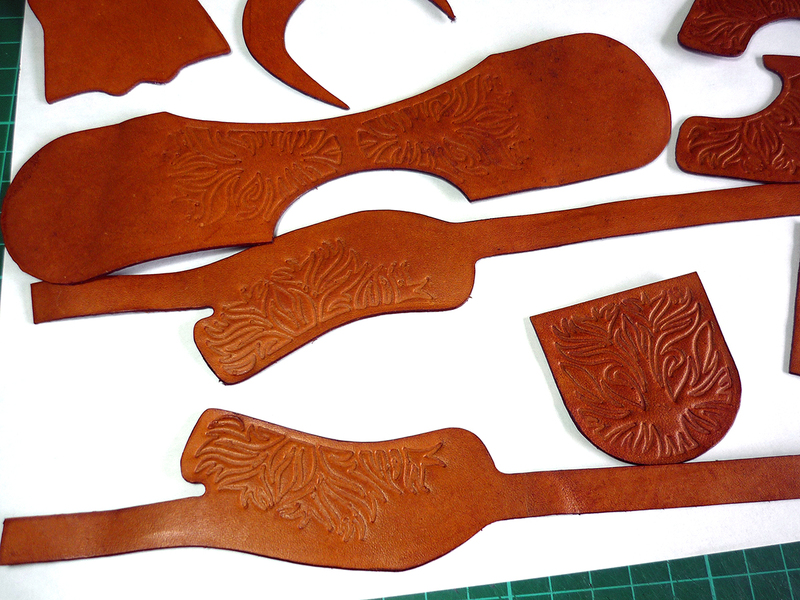 Dyed leather in Tan before any edging or conditioning, rather pale and uninteresting! 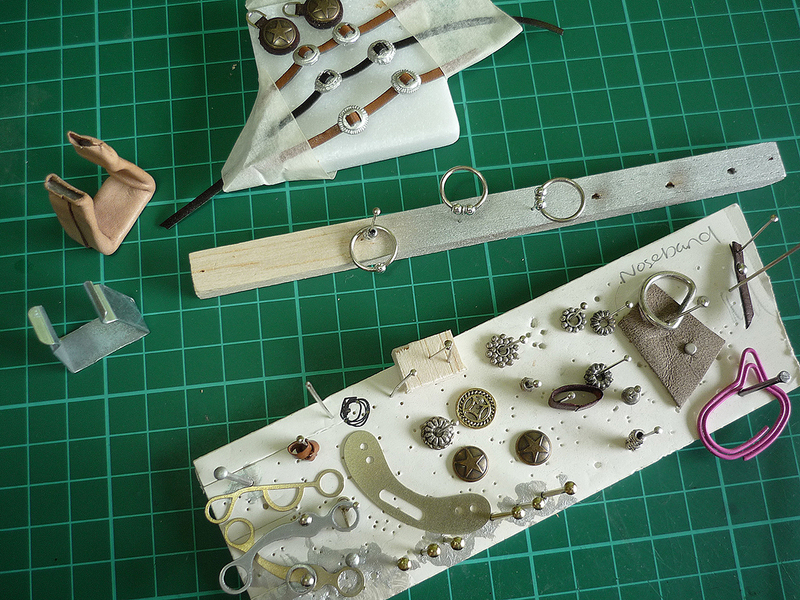 PREP – Working on the cut leather pieces before assembly.